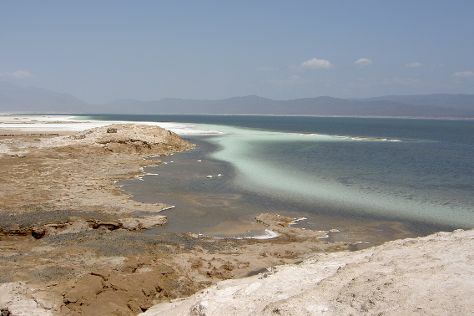 A small country with big sights, Djibouti has become known for its interesting geology and show-stopping topography. Limestone chimneys, salt lakes, offshore coral reefs, multi-colored mountains, mangroves, and sandy deserts provide the backdrop or focal point of a number of adventures during vacations in Djibouti. Away from the capital, Djibouti remains largely untamed and rural, with plenty of appeal for those into eco-tourism. Traveling down the coast and into the interior during a tour of Djibouti, visitors meet nomadic tribes and share in their singular way of life. Djibouti is in Africa. Use our Djibouti trip planner to arrange your visit to Djibouti and other destinations in Djibouti.